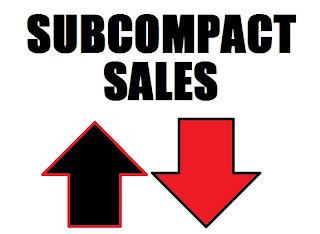 Some big gains in May in terms of subcompact sales. The Hyundai Accent, Fiat 500, and Toyota Yaris all posted triple-digit gains (month over month), and the Fiat 500 posted a huge year-to-date gain of 432%. Fading into sales oblivion is Honda's CR-Z two-door, two-seater hybrid, selling a miniscule 296 units, down 81% from this time last month; year to date sales are down about 72%, too. Heck, even the Nissan Cube looks like a sales champ compared to the CR-Z. Kia's Soul is the sales success so far this year with Nissan's Versa hot on its trail. Chevrolet's new Sonic is actually in third place, but there's a sizable margin between second and third. The other American competitor, the Ford Fiesta seems to be sliding. Ford's had around $1000 on the hood of the Focus for a while now, and nothing comparable on the Fiesta so it may be losing sales to its' big brother. Earth to Honda: Put the CR-Z's sport suspension tune and manual transmission in an Insight Si already! There's gotta be a market for a sporty FIVE-SEAT hybrid! too bad this chart doesnt indicate the massive dependence ford and chevy in particular have on fleet sales. i rent csrs quite often all over the country, and i see thousands upon thousands of sonics and fiestas. 20%+ of ford and gm sales are to rental fleets.